Look! A creature that survived 90,000,000 years! Kill it! Cheesy sets? Covered in snow, no less. Stop-motion monster? We wouldn’t be here talking if it didn’t. The plot’s pretty standard fare. The military tests an atomic bomb above the Arctic Circle — Why? Who knows? — and unwittingly unleashes a dinosaur that had been frozen in a sheet of Arctic ice for 90 million years. The only survivor of an avalanche caused by the dinosaur isn’t believed after he recovers from his injuries, but finds an unlikely ally in a lady paleontologist from “the university.” Just in time, too, as the dinosaur begins making its way down to the States, snacking on lighthouses and fishing boats along the way. Naturally, the response to discovering the sole surviving prehistoric creature of its kind is to blast it to smithereens. It's a 1950s American sci-fi movie, after all. There is a bit of a rationale thrown in, cribbed from War of the Worlds, in reverse. But still. There isn't a character in the film who advocates, even just to play devil's advocate, not blasting this dinosaur into the stone age. See what I did th— yeesh. That was a bad idiom/pun combo, even for me. Where the movie shines is in the stop-motion animation of Ray Harryhausen. 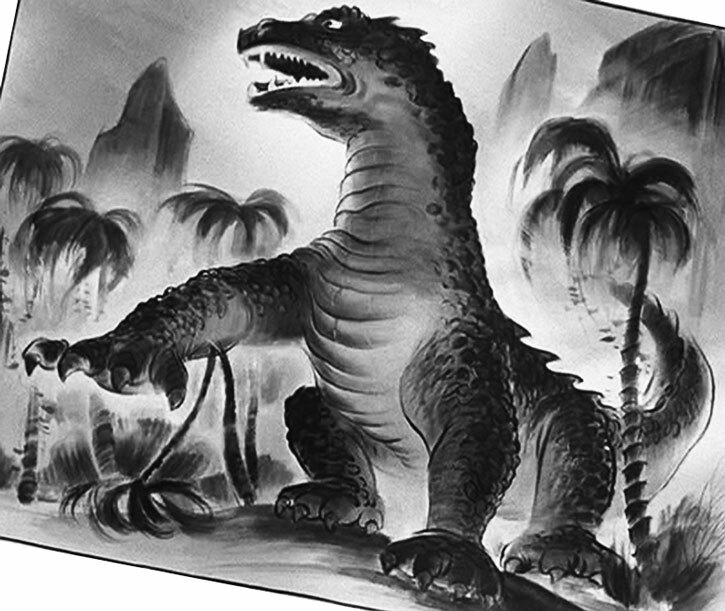 Sure, his masterwork was much later, arguably the skeleton army in Jason and the Argonauts or Medusa in Clash of the Titans, and perhaps his greatest character animation was in 20 Million Miles to Earth, but the animation here is still breathtaking, particularly in the finale — which inexplicably takes place at a roller coaster. Yep. At a roller coaster. This sequence alone is worth the price of admission. Me: That guy there saw a dinosaur and the paleontologist there is trying to help him figure out what kind. My daughter: She's a paleontologist? My daughter: Huh. I'm going to need to watch this one. 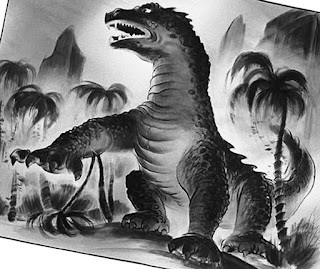 "Did the monster look like this concept drawing our art director made?" The second thing I'd like to bring up is the predominance of the military in almost all of these movies. I had always assumed the prevalence of the military and military exercises in the whole 1950s sci-fi scene had to do with a) the prevalence of inexpensive military stock footage, and b) Cold War fears about The Bomb, but this movie was just uninteresting enough in parts for my mind to wander. I wondered if it didn't also have to do with the residual effects of World War II, where the lives of the vast majority of the audience for these films were directly and profoundly shaped by military action. This movie went into production about seven years after VJ Day. Not enough time to forget, and not enough time for a new generation to be the primary driver of movie ticket sales. I don't know the answer, and probably scholarly books have been written on the topic, but since the main character, Nesbitt, was clearly a foreign-born, non-military scientist who was along on this mission for scientific, rather than tactical reasons, the rub there was a little closer to the surface (only a very little closer) than in most of the contemporary genre films where every male lead looked like some All-American quarterback who had just missed going pro. Finally, I want to give a shout-out to the TCM Greatest Classic Films collections. The version of this film that I have is part of a "Sci-Fi Adventures" set released under that banner. These collections, if you haven't seen them or have skipped past them in the stores, feature four classic films bundled together for about $20. I have this collection and a Cary Grant collection. There are many, many others — Astaire & Rogers, Musicals, Horror, Best Picture Winners, collections built around particular actors, etc. 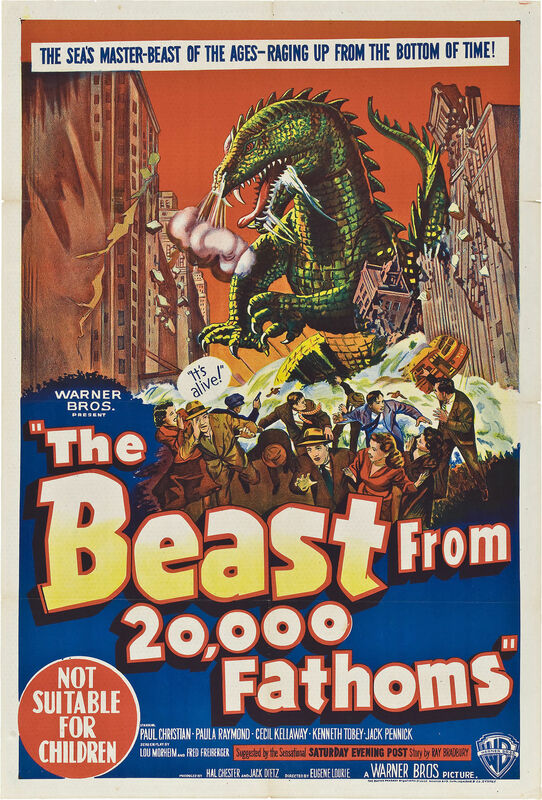 These are all good-quality transfers and discs with special features (The Beast from 20,000 Fathoms has three mini-documentaries about the film, Ray Harryhausen, and Willis O'Brien), and they're really a gem if you're into classic films. Cult Film Coefficient: 7/10. It's not the best 50s sci-fi movie you'll see, but it'll scratch the itch. Posted by Vance K — cult film reviewer and co-editor of nerds of a feather, flock together since 2012, Emmy-winning producer, no-good musician, and sometime animator.